310 mm wide, 375 mm deep, 150 mm high (12.5" x 15" x 6"), 11.5 Kg (25.5 lbs). 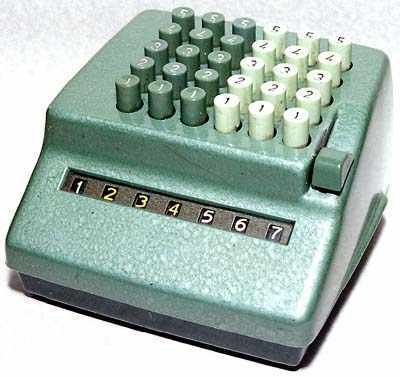 One of the more minimalist calculators made. Has 6 decades of keys, with only 1 to 5. To enter a number between 6 and 9 two keys have to be pressed in that column. The knob on the right is for clearing the total. Click here to go to Sterling currency "Comptometers".